Marathon FL Jet Ski Rentals & Tours | NEW Waverunners | Fun & Fast! All rates are per jet ski. Jet skis fit up to 3 people. Looking for some great action-packed summer fun for the whole family? We are Marathon’s premier waverunner/jetski rental company. Riding with us is the perfect way to beat the heat, quench your need for speed, and have a blast with family and friends. Jump the waves on your own personal watercraft as you power effortlessly across The Gulf. Experience the thrill of flying across the water at speeds up to 50 + mph with your safe and stable Yamaha WaveRunner rental. 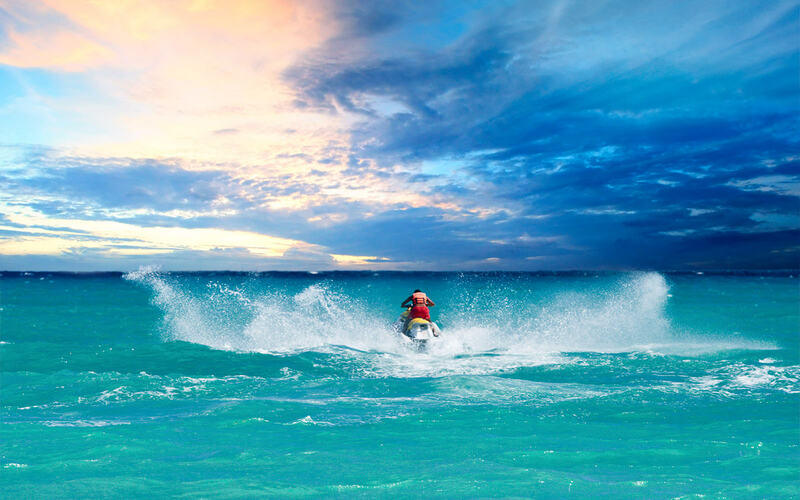 Each jet ski seats up to 3, which makes for a fun and affordable vacation activity. Join us on one of our tours, or rent a jet ski for a private ride – whichever adventure you choose, we promise our customers an enjoyable experience that you won’t forget! Jump aboard a WaveRunner and join us on a guided tour of Marathon. Your experienced tour guide will show you the marine wildlife that makes the Florida Keys a tropical paradise. Our guides will assist you to and from the riding area, ensuring that you are operating safely and in control at all times. We provide customer safety, satisfaction, comfort, and confidence with every rental! Try our “line of site” WaveRunner rentals available for ½ hour or a full hour. Come play in Florida Bay. Customer safety is our highest priority. Our staff are highly trained and fully experienced. All operators and passengers will be given proper, hands on training before heading out to the riding area, and fitted with life jackets. In regards to the law, anyone who was born on or after January 1, 1988, who wishes to operate and waverunner/jetski must have a valid photographic identification and with a valid Florida boaters safety course identification card. If you require a boater’s safety identification card, you may obtain a temporary one at our rental sites for only $3 or you may obtain your boating license online before you ride. We invite you to rent one of our jet skis or book one of our jet ski tours today and enjoy an exciting, adrenaline-filled Florida Keys adventure! Whichever Florida Keys island you are coming from, the scenic drive along historic Overseas Highway can't be beat! Jet ski tours take place at the Dolphin Bay Watersports Tours location behind the Hampton Inn in Marathon. Prices are exclusive of tax and a 20% service fee added for your convenience. Prices are subject to change. No shows and cancellations are subject to full fare at our discretion.